President Kenyatta remains the most popular Sub-Saharan Africa leader on Facebook, a new study shows. 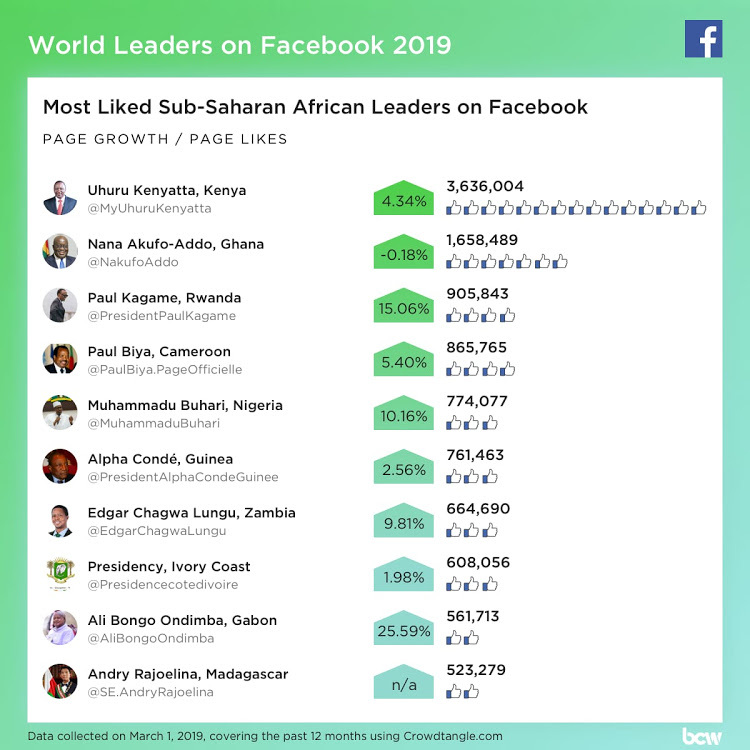 The latest Burson Cohn & Wolfe report for 2019 World Leaders on Facebook shows that Kenyatta has 3.6 million likes on Facebook. President Nana Akufo-Addo of Ghana is second with 1.6 million likes followed by Rwanda’s Paul Kagame (905,843 likes), Cameroon’s Paul Biya (865,000) and Nigeria’s Muhammadu Buhari (774,000). Globally, Indian Prime Minister Narendra Modi remains the most popular world leader on the social media site with more than 43.5 million likes on his personal Facebook page. United States President Donald Trump is second with more than 23 million likes on his personal Facebook page followed by Jordan’s Queen Rania with 16.9 million likes. New Brazil President Jair Bolsonaro has been found to have the most Facebook interactions in the last one year. “Brazil’s new President Jair Bolsonaro, who took office on January 1, 2019, has dominated the rankings of World Leaders on Facebook over the past 12 months, taking the top spot in terms of interactions,” Chad Latz, Chief Innovation Officer says. The study shows that Bolsonaro’s personal Facebook page has recorded more than 145 million interactions, nearly twice as many as US President Trump, who has 84 million interactions. The study used aggregate data from Facebook’s CrowdTangle tool to analyze the activity of 962 Facebook pages of heads of state and government. “With Facebook’s change of algorithm, favoring posts from friends, family, and groups, it has become more difficult for pages of governments and world leaders to reach their audiences,” Latz says. “While world leaders registered 1.1 billion interactions in 2016, that number has decreased by 32.3 percent compared to their interactions in 2018,” he adds. Should You Resolve Not to Gossip in 2019?